Life never stands still, and the addition of children is no exception. That previously neutral-toned room will probably look a little out of place with bright children’s toys and furnishings. Bright, colourful and cheerful paint schemes help create stimulating environments for children. While very young children only see in black and white, it is not very long before they appreciate the angst you experienced deciding the final colour scheme for their room. And once they get old enough to tell you they don’t really like the colour, you can always repaint it (or get them to do it)! Resene ColorShops stock a full range of paint, accessories and wallpaper. From bright and bold to relaxing and neutral, our trained professional staff will help you choose colour confidently. While you are in-store, ask about the Resene ColorShop Card to enjoy savings on future purchases. Most families decide to redecorate when they have children. Whether you decide to do this before or after your child is born, there are still some important points that you should keep in mind. The main issues are covered in this brochure. For more information on these and any other paint or colour related questions, please come and see us at your local Resene ColorShop. Strongwilled, excitable and opinionated – today’s children know just what they want, sometimes much to the horror of their parents. Children are increasingly influencing the way their bedrooms are laid out and coloured, injecting their own personality into their room. To simplify choice for children and parents alike, Resene offer KidzColour – a range of 72 hues and metallics designed for children of all ages. For those with a newborn in the house, Resene KidzColour also includes a smaller palette of soft pastels that may be mixed and matched with each other or used as a base for one of the brighter accent colours. From red Resene Chaos to green Resene Grass Stain and not forgetting purple Resene Topsy Turvy, this colour range has been designed with children for children. All solid colours from the Resene KidzColour range are available in popular Resene testpots – perfect for all painters no matter what age. The Resene KidzColour range also includes favourite effects finishes, such as Resene Magnetic Magic and Resene Blackboard Paint. Resene Magnetic Magic is an innovative magnetic base coating that will turn walls into magnetic boards suitable for use with a wide range of magnets. Resene Blackboard Paint is a premium scrubbable waterborne coating for all types of interior and exterior smooth surfaces where a hardwearing blackboard coating is required. It is easy to apply – in fact the hardest part is keeping would-be chalk artists away long enough to give the paint time to dry before they start covering it up with chalk! Children grow fast and tastes change rapidly, so make sure your plan incorporates options for the future. If you don’t mind completely revamping the room in a few years, you can opt for a fully themed room… but be prepared to change it later! Latest trends and fads can be incorporated using cushions, posters, wallpaper borders and toys that can be easily changed as the trends and fads do. Check out what others have done in the past in the online Resene Decorating inspiration gallery. With colours and finishes galore, children and parents can design a bedroom that will be the envy of all their friends without breaking the bank. And, as the child grows and develops new tastes, it’s easy to simply add a new feature colour or repaint a no longer liked hue to create a whole new look. Don’t forget, there are lots of great effects you can create using paint and metallic effects finishes, stamps, sponges and general arts and crafts activities to add wall art, pencil holders and more to the finished room, so let your imagination run wild. Stencils, clouds, stripes –the list goes on! To get you started some suggestions are included on the Resene KidzColour chart and on the Resene website. Plus you can download lots of free stencils to get you started. Let your children loose with colour. The Resene KidzColour collection is available from Resene ColorShops or order your copy online. Ever felt dizzy from paint fumes? The effect is magnified when painting indoors and is even worse if it is a child that is exposed. Indoor air quality is important, especially if you are planning to paint your child’s room. Not only do you want to minimise the fumes while painting, but you also want the paint odour to disappear quickly so you can put the area back into service without putting any family members at risk. While the odour levels of standard Resene paints are not high, Resene have developed low odour products – Resene Zylone Sheen, Resene Zylone 20 and Resene Ceiling Paint – and volatile solvent free Resene Zylone Sheen VOC Free to help you and your family breathe easier. Or choose durable and washable Resene SpaceCote Low Sheen, which is Environmental Choice approved, low in VOC and ideal for the rough and tumble of children’s rooms and play areas. The lack of solvent fumes means they are more pleasant to use than standard products and the area can be quickly put back into service. Improving indoor air quality can also help prevent headaches, asthma, nausea, dizziness, respiratory complaints, allergic reactions and improve general well-being. With no nasty solvent smells, easy clean up in water and a wide colour range, the hardest decision will be choosing your favourite colours. Make sure any areas you paint are well ventilated with good air flow and if inside, open windows wherever possible. This will help the air to circulate and the paint to cure. Even low odour paints need this air circulation to ensure they cure properly and that any emissions from the paint can dissipate quickly. Resene have always been keenly aware of the need to reduce the risk that our products may present to our customers and the environment, long before it became topical. Not only did the basic innovation of Resene waterborne paints reduce the level of toxic solvents, but other steps such as the removal of lead from our decorative paints in the late 1960s were well ahead of their time. To reinforce this position Resene joined the Environmental Choice Programme, endorsed by the Ministry for the Environment, making it easier for consumers to select paint that eases the burden on the environment. 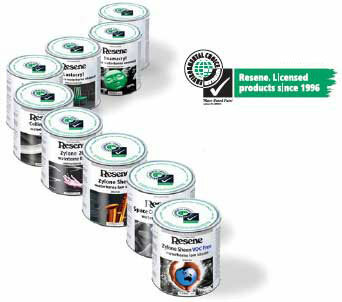 Look for the mark on Resene paint containers – it is confirmation that they meet the requirements of the Environmental Choice programme. Lead is a health hazard. You can get lead poisoning if you do not take care when you remove lead-based paint from a building. As lead tastes sweet, children are particularly at risk from lead poisoning because they may swallow bits of paint that contain lead or soil that has been contaminated. Children chewing on cots or toys are also at risk if lead-based paint has been used. Until 1965, many paints had high lead levels. Even if a building has been recently painted, it may have been painted with lead-based paints or have layers of old paint covered by modern paint. Today only special-purpose paints contain lead and these are clearly labelled. It is not possible to tell lead-based paints by their appearance, but there is a simple test that can detect whether the paint is a health risk. Resene ColorShops will test your paint flakes for lead-based paint for free. Simply take a large flake of any paint you suspect may contain lead into your local Resene ColorShop. If a building was built before the 1980s it is best to presume it has been painted with lead-based paint. Contact your local Health Protection Officer if you are unsure. Many adults and children with lead poisoning will have either vague or non-specific symptoms such as stomach pains, difficulty sleeping, constipation and loss of appetite or no symptoms at all. If your child has more severe symptoms such as weakness or difficulty walking, seek urgent medical attention. For more advice on lead-based paint, ask for the ‘Resene Putting Your Safety First’ brochure at your local Resene ColorShop, order a copy online or contact your local Council. Always keep paint and paint preparation and cleaning products securely closed and out of your child’s reach. As children learn to climb and open cupboards and drawers from an early age, a locked garage or shed is the most secure place to store these dangerous goods. Keep little hands busy with Resene arts and crafts activities. Try out the Resene Art Action art & poster, student acrylic and tempera paint range, ideal for children of all ages. Available in a range of colours. 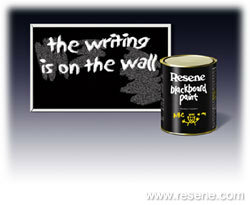 Visit the Resene website and try out Resene EzyPaint virtual painting. Virtual painting with Resene EzyPaint allows you to visualise the entire colour scheme before the redecorating even starts. Download Resene EzyPaint free or buy a copy from your local Resene ColorShop. Or download your favourite testpot character free, ready for colouring in or painting. Get testpots of your favourite colours and use them to paint your favourite testpot characters - if you make a mistake you can always print out a new page and start again! Have fun creating your own colour on any computer – simply visit www.resene.co.nz/createcolour.htm, adjust the slider bar, click on the large square to see that colour and you can create your very own colour. Print it out on a colour printer and take it into any Resene ColorShop for colour matching. No matter how you select your colours, always use testpots to confirm your choices in the area you are planning to paint. Resene testpots are available from your local Resene ColorShop or you can order online.